This month we rolled out a feature called Driver Journal, anticipated by a number of countries (USA, Canada, Australia and many others) where business expenses claim is a big deal. Quite a few companies take advantage of deducting their business-related transport expenses. Fewer do it effectively. Driver Journal will make a difference. While the new feature can be treated as an update to the well-received and thoroughly used Trip Reports, it has richer functionality tailored mainly for tax purposes. What does Driver Journal do? 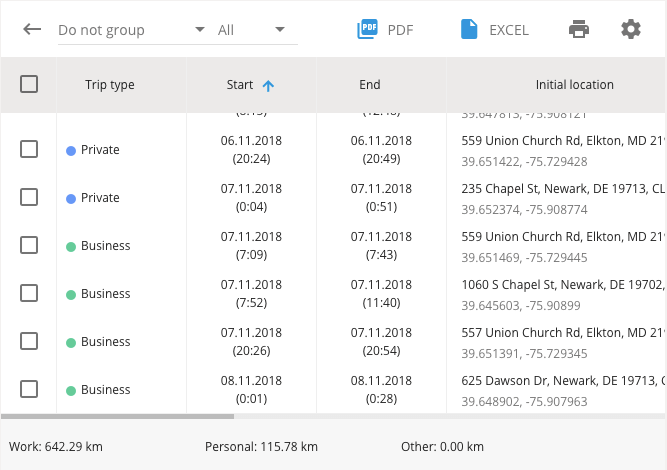 Driver Journal logs all the trips an employee made during a selected time period and groups them by their status: business, private or other. Users can choose to show either the summary of all trips with highlighted trip statuses or to view the required status only. The displayed data is already a finished document exportable as a PDF/Excel file or printed out as it is. Driver Journal itemizes all the trips, providing exact mileage, accurate location, date and time, so your clients can easily report business miles versus personal miles and deduct the exact amount of business-related expenses (e.g., by percentage of the actual expenses). However, some situations are not that easy to identify. For those cases, we added an option of “other” trip status (specific comments can be given in notes). Such trips can be reviewed individually and using valid metrics be later converted to business or private as the case might be. All the trip data will be safely and securely stored in one digital place. No need to keep the piles of paperwork! However, Revenue Services require to keep supporting receipts (for gas/fuel) to prove the actual amount of expenses. How to work with Driver Journal? Driver Journal is featured in Fleet. Once you choose the required time range it’s time to do some sorting. For those who need things to be done easy and fast we developed a user-friendly drag-and-drop tool. Just grab a trip needed and throw it to a relevant category. For those who prefer to stick to conventional ways we’ve kept the standard drop-down menu. It is super intuitive and visually-enhanced to speed up the process. A few easy steps and Voilà! It is up and running. The new Tax Season is well ahead, but it never hurts to start the preparations earlier, right? Please contact us at [email protected] to learn more.